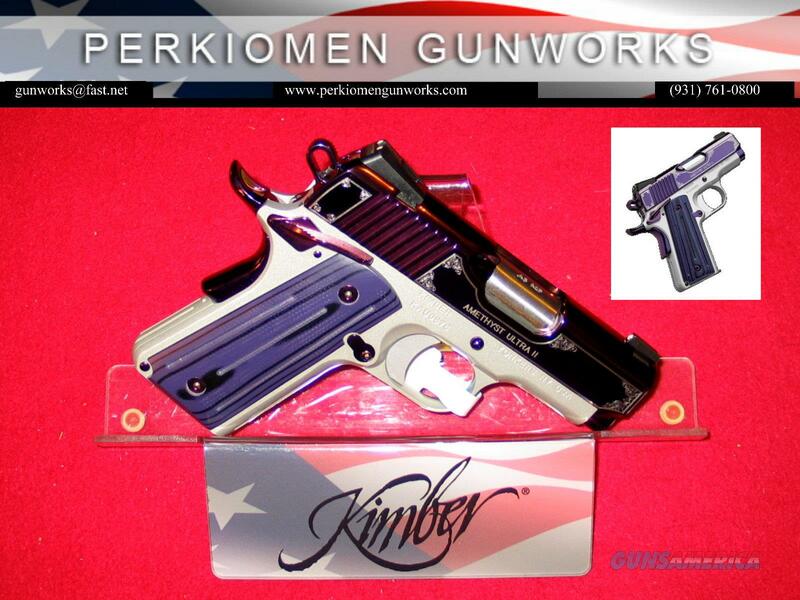 Kimber AMETHYST Ultra II, .45acp, 3”, Special Edition 2016 issue, New in Box. Kimber # 3200363. This beautiful slim carry piece has a highly polished stainless Steel slide and wears a beautiful Amethyst (Royal Purple) PVD coating with cut scroll engraving and border – see photos. Some of the additional features are: Ambidextrous thumb safety, 7+1rd magazine capacity, Satin Finish frame, front strap serrations, PVD coating on small parts, grooved mainspring housing, round heel, Tactical wedge night sights, purple ball-milled Micarta Thin grips and match grade trigger. New in hard case with lock, manuals, tools and one Kimber mag.